Instagram is a social networking app to share photos and videos from a smartphone. It has more than 600 million users. Instagram has grown very fast in last 2 years. When you post a photo or video on Instagram, it displays on your profile. Other users who follows you can see your posts in their own feed. Likewise, you can see posts from other users whom you choose to follow. There are so many tricks available for Instagram app but one of them is in trending these days “send More than One Heart on Instagram”. In this article I am writing about an Instagram trick through which you can send multiple hearts to someone you love. As for now if you notice that you can send only one heart at a time on Instagram. But sometimes we want to send more than one heart to someone so this Instagram trick is for you. Step 1. First of all open any chat on your Instagram app and send any message like “HI”. Step 2. Then double tap on that message and just right after that tap on the heart icon again and again quickly. Make sure you are doing right – double tap on the message and than tap on the heart icon quickly again and again. Step 3. 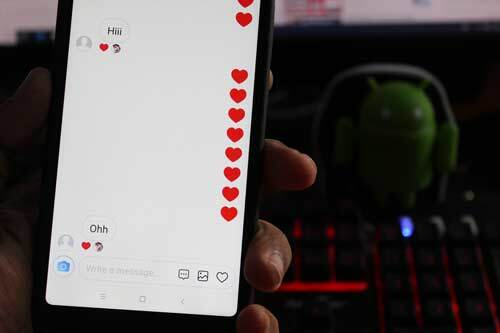 So now you can notice that you are able to send more than one heart on Instagram. I am exploring more tricks for Instagram continuously which I will share with you soon. If you have any query then please comment below.